Toronto city takes pride in hosting Yogapalooza, a celebration of Yoga, movement, music and meditation. Yoga, dance, martial arts and live music come together for an uplifting community experience. The festival started with Salimah Kassim-Lakha’s vision of bringing people from all walks of life together to share the benefits of the practice. 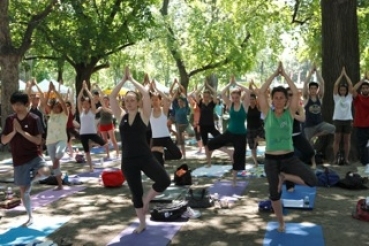 The first Yogapalooza happened at the Pride Festival in Toronto at Queens Park in 2010. Now Yogapalooza has grown into a multi dimensional festival championed by many. The flagship event takes place at Toronto’s Harbourfront in the third weekend of August. The festival offers free classes for families, those new to yoga, and experienced yogis which all will enjoy. Many class experiences are on offer over the course of the two-day festival, providing the best opportunity for exploring different levels of Yoga, especially for beginners new to the lifestyle. Different kinds of yoga, including Hatha Yoga, Laughter Yoga and Kundalini Yoga are showcased. Guests can groove to the sounds of the drumming circle, stretch out their stress, and connect to their playful side through yoga, martial arts, dance and music. It includes a kids’ yoga space, wholesome marketplace, community booths, live music and more. Yogapalooza serves to uplift individuals, families and communities with a mission to inspire connections though consciousness and open hearts. The festival to celebrate the age old Indian traditional Yoga is taking place in Toronto when remote Indian towns (including our town Kottayam) are celebrating opening of a new McDonalds or Kentucky Fried Chicken (KFC) outlet with mile long queues of the young generation. Here is a great success story of Lululemon Athletica, a Vancouver (Canada) based company catering for Yoga apparels and equipment. The company generates over a billion dollars in revenue and has over 200 outlets in Canada, US, Australia and New Zealand.After 20 years in the surf, skate and snowboard business, Chip Wilson took the first commercial yoga class offered in Vancouver and found the result exhilarating. The post-yoga feeling was so close to surfing and snowboarding that it seemed obvious to him that yoga was an ideology whose time had come again. Even though Yoga does not require the Yogis to wear any special clothing or shoes, most Yogis in North America were wearing cotton clothing which seemed completely inappropriate to Chip Wilson, whose passion lay in technical athletic fabrics. From this, a design studio was born that became a yoga studio at night to pay the rent. Clothing was offered for sale and an ‘underground’ yoga clothing movement was born. The success of the clothing was dependent on the feedback from yoga instructors who were asked to wear the products and provide their insights. Founded in 1998, Lululemon’s first real store opened in the beach area of Vancouver called Kitsilano, in November of 2000. The idea was to have the store be a community hub where people could learn and discuss the physical aspects of healthy living from yoga and diet to running and cycling as well as the mental aspects of living a powerful life of possibilities. Unfortunately for this concept, the store became so busy that it was impossible to help the customer in this way and also sell their products. So the focus of training shifted solely to the Lululemon educator or staff person. The goal was to train people so well that they could in fact positively influence their families, communities and the people walking into the stores. Although the initial goal was to only have one store, it was soon obvious that there was a huge demand for their products as the Yoga Craze had gripped the entire North America by then. Lululemon Athletica during that time has gone from complete obscurity to now defining and dominating their category. In the process, they have taken away a significant market share from the brands like Nike, Adidas, Puma and Reebok. Unlike these mega-brands, Lululemon have chosen not to spend millions of dollars to sponsors like a Michael Jordan or David Beckham, instead have wisely opted for a more local approach. They identified 20 most respected yoga teachers, personal trainers and fitness leaders in the area and give them a couple of free shirts and bottoms. Simple enough, but they did not stop there. They then took professional photos of these influencers and blew them up onto massive canvases to display in their stores. The ‘models’ now appeared as celebrities and this increased their credibility as respected and valued members of the community. Plus, because they contain captions such as, ‘Dana Cope, Owner of Chatswood Yoga’ it is free advertising for the local trainers which helped them to grow their business. The combination of free product, free exposure and the more subtle benefit of appreciation, meant these local identities become fiercely loyal and wear only Lululemon clothes. As their business grew, more people saw and wanted the gear worn by their trainers, which led to hordes of new people into Lululemon stores. An excellent win-win scenario was born. Even though most of their products are high priced, they are in great demand as their business turnover proves. Yoga for sure has been exploited by the North Americans in a great way to turn out Yoga teaching centers, apparels and equipment. Now let us watch out for the next Indian item on the agenda, waiting to be exploited by the North Americans. Yesterday we, me and my sister in law in US, discussed the same at length. They are well on their way to patent ” Lord Krishna” too. Otherwise enjoyed the write up.